Official app of the Aquarama water park in Benicassim where you can buy tickets purchasing and access to the Aquarama Club. 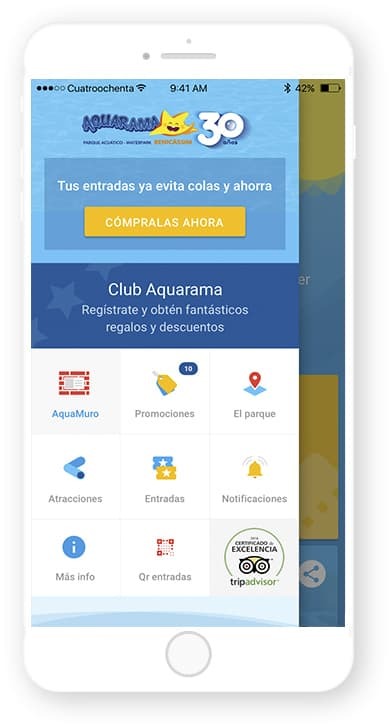 Official app of the water park in Benicàssim (Valencia region, Spain), Aquarama, developed by Cuatroochenta for their 30th anniversary, honouring their users’ fidelity. It allows advance tickets purchasing and access to the Aquarama Club, offering tickets and different gifts through a fun system of voucher exchange for promotions. The application also boasts a wall with all the updated information on the park, among other features. Login access to become a member of the Aquarama Club, granting access to a number of benefits, beginning with an end-of-season raffle of juicy gifts among their members. Being a member of the Aquarama Club, for buying tickets through the app, one can get access to different gifts through a vouchers system. Among these gifts they are to be highlighted tickets offers for the park itself. The prizes are delivered in digital voucher format, validated by the Aquarama staff. News, promotions and weather forecast in the park. Customised card on every park attraction with photos and videos. Direct sale of advance tickets.